Today, we had a photo shooting of the Saami Rotei owner’s grandchilds on the occasion of the “seven-five-three”. The family of the grandchilds came back to Japan after a long time overseas in the United States. Koyuri-chan is 5 years old and Aoi-chan is 2 years old. 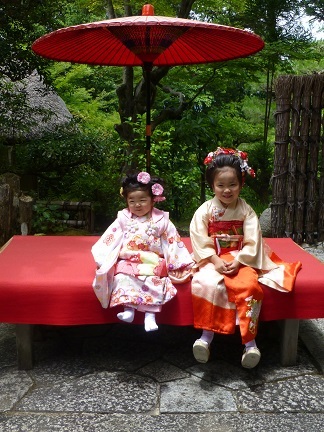 In the hot and humid weather, it was not easy for them to wear the traditional kimono during the photo shooting. However, they did not complain at all and we appreciated their efforts. The event of the “seven-five-three” celebrates the growth of children. It is assumed that it gives an awareness to itself. In addition, there is the spirit of the Chitoseame which help the children to grow well and to live longer. 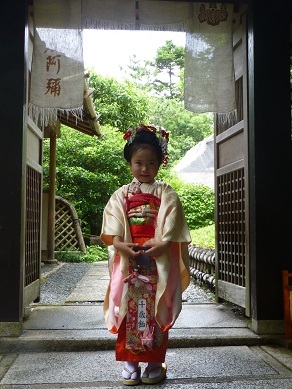 Koyuri-chan had had her hairstyle done as a Maiko. The two of them looked really cute. Everyone was staring at them. Please, look forward the pictures of this event in the album!